Spiral Wishing Wells are great wherever large amounts of people gather. Using these advantages, a typical stadium or coliseum program can include the following. Coin Revenue: A Seven-Footer in the team colors located where the most people pass by will generate significant long term revenue for your preferred charity. The charity can be changed as often as desired. Of course, it is permissible to "recoup" the cost and shipping from the initial income. But after that is recovered, 100% of the ongoing income goes to the listed charity. If there is not sufficient floor space for a Seven-Footer, we have two smaller sizes to consider. Using the "power of the microphone" can be as simple as reminding people to "...be sure to empty your pockets of coins and have a little fun at the Wishing Well on your way out of the stadium..."
Sponsorship Income: The stadium can also get a corporate sponsor for the Well which can be an annual fee. This money can either go to the stadium's profit, or can be given to the charity. Either way, the corporation is getting the best kind of exposure with their name prominently displayed on and around the Well in the context of charitable community support. Grants Available: If 100% of the coin revenue is given to charity (after initial payback if that is done), grants are available to help reduce the cost of the Wells. Pre-event announcements at the stadium and by the local media can promote the event such as, "Let's set the one-day income record for the most money tossed into a Spiral Wishing Well. We encourage everyone to bring all those coins they have been collecting at home to the game on (day) and watch them spin around the coin funnel for charity. 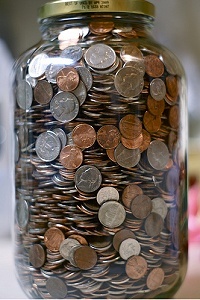 The average home in America has $50 worth of coins in jars and under seat cushions. Get the kids involved hunting for coins. Let's set the record. All proceeds go to (name of charity or project)." Logistics: The amount and weight of the coins brought to the game that day will be significant and will need to be managed. We suggest you get a local bank or vending machine company to provide coin-counting machines and transportation of the coins to the bank. They will love the publicity they get from participating. This will allow people to dump their coins through the counting machines, get a receipt, and then either continue into the game, or drop them into the Wishing Well. You can give away a mini-well Vortx toy to everyone who donates $50 or more. This can generate extraordinary income. The wholesale cost for the toys when you also have a Seven-Footer is $12.50 each, so it can really increase the total amount raised, especially when you consider the number of people who will participate. Even if they don't have a lot of coins, they will write out a check or cash. VortxT Mini-Wells are much more than coin banks. They are "interactive" so you can make the coin climb back UP the funnel. Click here to see a short YouTube video of the game called, "Coin Limbo". This game is fun for young children, and challenging for the best athletes. They are also educational. Our Student Guide is used by science teachers for classes about tornadoes, whirlpools, planetary orbits, and black holes in space. The Vortx's toys are great gifts, and lots of fun for show-and-tell. Vortx's do not require batteries, and they are completely unique compared to the traditional toys on the market. So parents and grandparents love them and will gladly donate $50 to get them for their children and grandchildren. Logistics of toy delivery: It would be great to have Vortx's right there on the spot, but that is impractical since you would not have any idea how many to order. To keep the logistics simple, you can give receipts to everyone who donates $50 or more, and then you can place the order for the number of toys you need. We can ship them to a partnering retail location within your city, and people can show their receipt and pick them up. 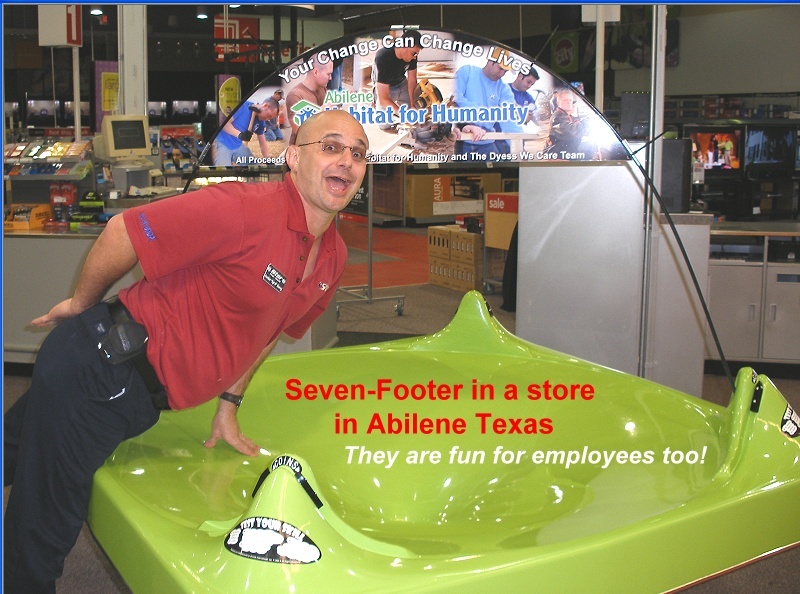 It is easy to find a partner who is willing to do this because they LOVE to have people walk into their store, restaurant, or other facility. How much can you raise in one day? We believe, that with an organized promotion, it is possible for a stadium or coliseum to easily raise over $100,000 in one day, and perhaps as much as a million in large venues. It is all based on the numbers. If just 1,000 people bring their loose change from home, and it averages $50 each, the total would be $50,000. But if 10,000 people do that, it would be $500,000! Add to that the number of people who would donate $50 or more with a check or cash to get a free Vortx toy, and the possibilities are endless. You can place your Well in a local shopping mall or loan or rent it to local churches, schools, and other charities when not in use at your stadium or coliseum. This becomes a great advertising vehicle for you, and it helps the local charitable community. You can loan it at no charge, or rent it for the normal 50% rate with your part going to your preferred charity. The borrowing charity picks it up and brings it back, so it is a very simple option. We have a turn-key loan/rental kit that includes a template press release that announces the availability of the Well for charity use, and a simple loan/rental agreement. We would gladly refer the many inquiries we receive from your area to you since we don't rent from the factory. Spiral Wishing Wells not only generate significant ongoing passive income, they can generate extraordinary income at a kick-off type event which can be repeated at least once per season. We will gladly help you put the program together, including press releases and communication kits for the media, sponsorships, and the logistics. Please call me directly (1-937-985-5863, Eastern USA) or send an email to discuss the stadium program in more detail. Let's do it this season!